Wild cats in Monteverde Costa Rica. The recent find by traffic police of a dead puma outside the cloud forests reserves in Monteverde, as well as frequent spotting by farmers are pointing to the fact that pumas are not as uncommon as thought. The unfortunate puma was taken to the Santa Elena to be prepared for display (for educational purposes) by Costa Rica`s leading taxologist (Jorge Porras, Natural Science Museum La Salle). The puma is to be used as symbol for the need for drivers to take care when driving in Monteverde. The builders of the new road to Monteverde are providing wildlife "corridors"- under the road: the accident with the puma supports the need for this type of green passages. No doubt one of the main reasons you want to visit Costa Rica is its unparalleled biological diversity. We have already talked about the cloud forest’s stunning array of plants, insects, herptiles and bird life — and yes, the furry animals follow that same splendid pattern. The country is home to about 207 species of mammals, at least 120 of which can be found in Monteverde’s high-elevation habitats. As a group, mammals are more enigmatic than all of those other flashy creatures. They are typically nocturnal and shy, making them more difficult to observe. So, while Monteverde’s biota (the total collection of organisms of a geographic region) is well-studied within the country, the research that has been conducted on most mammals concerns basic information about species distributions, and not much more. Often the animals that visitors are most excited about seeing are the large, charismatic species. For example, you may wonder, do large wild cats even persist in this area, and will you have a chance to spot them. Well, yes and no. Happily, among Monteverde’s 120 species from 10 mammalian orders and 25 families are 6 (!) species of cats, the members of family Felidae (that’s pretty impressive, considering that the felids throughout the Neo tropics number only 12 species). (with data from Timm & LaVal 2000, and Ruiz-Garcia & Shostell 2013). uncommon* these cats are being seen regularly by hidden cameras in the Santa Elena Reserve - so perhaps not too uncommon! The cat fauna of Costa Rica is believed to have originated from North America. In fact, this species assemblage is relatively recent, compared to the groups of cats found on other continents. Costa Rica forms part of a narrow land bridge between North and South America that facilitates the spread of species between the two areas, starting sometime around the boundary between the Pliocene and Pleistocene epochs (roughly two million years ago). Details about the ecology of wild cats are not well known. These fascinating animals occupy the highest trophic levels in their ecosystems, and they attract the passionate interest and attention of people. However they are even more elusive than mammals in general, and they need large home ranges with plenty of space to live, hunt and roam. They therefore have spotty distributions across large and often remote areas, making them all the morechallenging and expensive to study. Studies of cat community structure, breeding and behaviour have not been conducted in Monteverde. Worldwide — and certainly in the Neotropics — wild cats face steep population declines. The main pressures on them are human population growth, along with the inevitable deforestation, habitat degradation, hunting, and associated ecological change that happens when people move into natural areas. Carnivores do not respond well to sudden/large-scale habitat changes, due to their small population sizes, slow growth rates, and large space requirements. The creation of protected areas like those in Monteverde is one of the main strategies for safeguarding the critical habitat of these animals. While the odds of actually seeing a cat while you are on a forest walk are fairly slim, spotting signs of them is entirely possible. The Desafio guide Rodrigo Solano recently took this picture (left) in the Monteverde Cloud Forest. And to make sure you really know what to keep your eyes open for, here are some facts about the six species that live in the cloud forest, ordered from smallest to largest cat. Good luck spotting, and happy trails! Henderson CL (2002). Field Guide to the Wildlife of Costa Rica, University of Texas Press, Austin, TX, USA. Morales MM &Giannini NP (2013).Pleistocene extinctions and the perceived morphofunctional structure of the Neotropical felid ensemble.Journal of Mammalian Evolution.doi10.1007/s10914-013-9244-3. Ruiz-Garcia M &Shostell JM (Eds),Molecular Population Genetics, Evolutionary Biology and Biological Conservation of Neotropical Carnivores.Nova Publishers, New York, NY, USA. Timm RM & LaVal RK, Eds. (2000). Mammals. Pages 223-244 inNadkarni NM & Wheelwright NT (Eds). Monteverde: Ecology and Conservation of a Tropical Cloud Forest. Oxford University Press, New York, USA. (1.5 to 3kg):Like the other closely related spotted cats, the Margay and Ocelot, this species is most active at dusk and during the night. Its small size is similar to that of a slender house cat. It prefers forested mountain habitats, where it hunts mostly on the ground for the diverse small animals that form the diet. 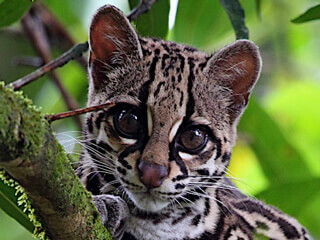 (2.5 to 4kg): This nimble spotted cat looks similar to the larger Ocelot, with larger eyes, and a longer tail and legs.The preferred habitat is dense forest, and accordingly the Margay is known for its phenomenal tree-climbing skills. At night it hunts for an array of small prey items in the forest canopy. 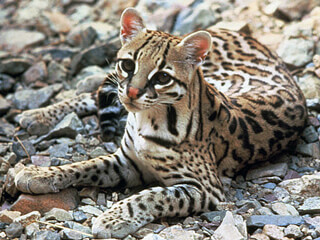 (8 to 18 kg): This largest of the Neotropical small spotted cats is mainly nocturnal, and highly territorial. Once found all the way up to Arkansas in the United States, today its range extends from southern Texas throughout Latin America. 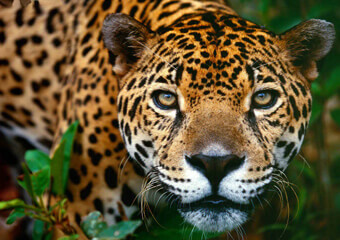 This cat can occupy a diverse range of habitats, from grasslands to tropical forests. During the 1950s and 1960s it was very common in Monteverde. Today it is uncommon though the population is viewed as stable. (3 to 10kg): This small cat with short legs and a long tail comes in two colour forms, either reddish, or brownish-grey.It is active by day, when it hunts small prey on the ground including birds, reptiles and mammals. 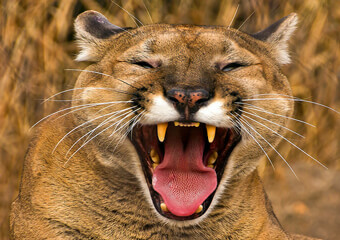 (25 to 80 kg): Pumas live in a broad range of habitats including all forest types. 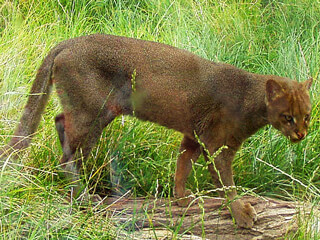 Like the Jaguar, Pumas hunt medium and large-sized mammals, however they tend to stay in more open areas, where deer are likely to be found. They are uncommon at Monteverde, which is thought to perhaps have always been true for this species in the area. (30 to 120 kg): This largest cat of the New World commands both the admiration and fear of local people. As a big predator, it depends on great swaths of intact habitat with high prey availability and low human density. 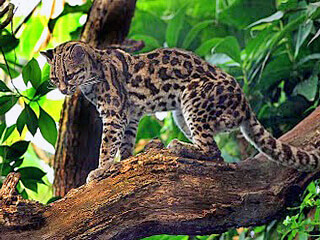 Today these large cats are rare throughout the entire region, but they were relatively common until the late 1950s. People were known to shoot them on sight because the cats took livestock. 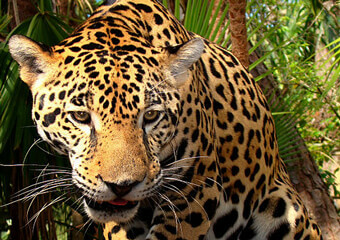 Jaguars eat mainly other mammals. While they are considered to be “Near Threatened” by the International Union for the Conservation of Nature (IUCN), current assessments suggest that the potential still exists to safeguard the species across its full range (sadly, unlike many large predators with some habitats and / or populations that are too damaged to fully recover).